I love fall and winter vegetables. I love the idea of roasting cauliflower, but it's often either overcooked mush, or too crunchy for any use other than crudite. The idea of a cauliflower gratin is appealing, but most takes are just too cheesy, more like melted cheese with just a hint of cauliflower. Last week, I hit the farmer's market and returned home with several heads of cauliflower, determined to make the perfect roasted cauliflower. I think I succeeded. This dish is the perfect fall or winter accompaniment to a roasted chicken, pork roast, pot roast and it would make a terrific Thanksgiving side. Clean the cauliflower. Pull off or cut up bite sized florets, leaving the coarse core behind. Texture is as important as flavor. I find the roasted cauliflower often retains a bit too much crunch. 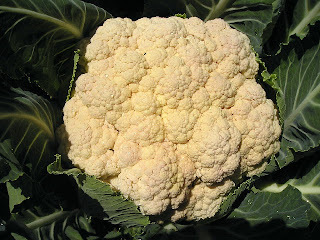 I deal with that by blanching the cauliflower before roasting. Toss the cauliflower into the boiling water for about 2-3 minutes. You just want to take the harshest crunch off the veg. Remove from the water and toss it in a bowl with olive oil, salt and pepper. If you are planning ahead, cut some bread and let it sit out for a couple of hours to get stale. If you haven't planned head, don't worry about it. The bread crumbs can be thicker (which they will be with fresh bread), so don't sweat it. Run the bread, with the sage leaves through the food processor. Place the cauliflower into a baking dish. Top with the bread crumb/sage mixture. Spinkle on the parm. Drizzle just a bit more olive oil on it. Cover with foil and bake at 425 degrees for about 25 minutes. Then remove the foil and bake for another 10 minutes, so that the cheese and bread crumbs get nice and brown. I am so making more of this today.